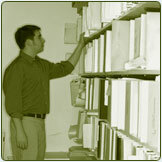 "HIPAA & Business Continuity/Disaster Recovery Overview"
"Vital-Records Storage -- Off-site vs. On-site?" "Avoiding data disaster  Many small businesses fail to protect their core documents from the threat of calamity." "Fireproof Goods Protection  Don't let tenants get burned"
"Moving from 'If' to 'When'  Addressing the Urgency of B/C Mgt." "How to prevent an information disaster"
"The Bioterrorism Act — Implications for Vital Records Protection"
"American Banking Association — Records Management"
"The CFO’s Role in Disaster Recovery"
"Electronic Document Management for CPAs"
"Organizing Your Important Papers "
"VRP is Key to a Company's Survival"
"The Heartbeat of the Hospital"